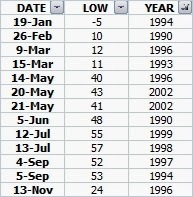 Until this morning, these low temperatures were the only record lows set or tied since 1990 at the Airport. Notice it's been 11 1/2 years since the last record was set (May 21st, 2002)...an awfully long time. This morning's low through 7 AM of 20 at the Airport is not only a record low for the date but it's also the coldest November morning in Philadelphia since November 24th, 1989 (low of 19 that morning at the Airport) and the first cold season (October 15-April 15) record low since November 13th, 1996. Record lows were also set in Trenton (19) and tied in Allentown (16) this morning. We have had a number of record cold highs since 2002, including yesterday's 32 degree "high" but nothing in the low bucket since the May 2002 cold snap. Yeah, pretty cold indeed given that some years this is the coldest we ultimately end up and that these lows are colder than our average low in many locations for this date!